Brazilian low-cost carrier Gol has revised its domestic capacity plan for 2012 to a zero growth scenario and is hinting its domestic ASKs this year could even fall after growing by 7.4% in 2011. The country’s largest carrier, TAM, also plans less than 2% domestic capacity growth for 2012 after expanding its domestic ASKs by 9.5% in 2011. Both carriers are exhibiting capacity discipline in the hopes of continuing a yield recovery that began during 2H2011. But at the same time other domestic Brazilian operators, including Azul, Avianca Brazil and TRIP, continue to rapidly expand. Gol revised its capacity forecast as it posted last week a BRL710 million (USD389 million) loss for 2011 and a negative 2.5% pre-tax margin. The losses were largely due to a 23% hike in the carrier’s fuel costs, currency fluctuations and non-recurring expenses related to aircraft returns. Gol and new Gol domestic subsidiary Webjet have begun the process of cutting 80 to 100 daily domestic flights. This represents about 8% of their current combined offering of 1100 daily flights. Gol agreed to purchase Webjet in Jul-2011 and while the acquisition has not yet been completed, 87 days of Webjet's operation were included in Gol's 2011 results. Yield recovery continued in Gol’s own domestic operation during the first two months of 2012, growing 4% in January and 9% in February. But load factors continued to fall, dropping 4.2 ppts year-over-year in January in its domestic market to 76.2% and 4.6 ppts to 70.3% in February. Gol’s domestic traffic fell 1.8% in January and 3% in February. Gol CFO Leonardo Pereira told analysts during an earnings call last week that the carrier has zero tolerance for flights not producing returns, citing a specific focus on late night flights. It is a slightly different philosophy than rival TAM, which a few years ago developed a strategy to increase load factors during off-peak hours (see Background information). TAM executives recently said the carrier is seeing significant improvement in load factors during off-peak periods. But a larger portion of TAM’s capacity, 10.3%, is dedicated to international flights, so the carrier has the benefit of higher load factors on late-night long-haul flights. Only 5.2% of Gol’s capacity is now allocated to international flights. Mr Pereira admits that the demand Gol recorded during the first two months of 2012 was not in line with the carrier’s expectations, and the carrier is seeing a slowdown in the Brazilian economy. Its latest forecast shows a worst case scenario of 3% GDP growth for Brazil and 7% to 10% growth in domestic traffic for the overall Brazilian industry. TAM, which posted a BRL335 million (USD183 million) loss in 2011, estimates 8% to 11% domestic traffic growth in Brazil this year and believes by keeping its capacity growth between zero and 2%, load factors will improve and lift yields and revenues. TAM management recently told analysts it foresees posting high single-digit growth in the domestic market this year. In January, TAM’s domestic traffic grew 1% on a 4.3% capacity increase, driving load factors down 2 ppts to 76.5%, according to data from Brazilian aviation authority ANAC. For the month, its share of domestic traffic fell to 40.7% from 43.3% the year prior. Both Gol and TAM have steadily reduced their capacity estimates for 2012 in order to regain strength in domestic yields that was largely wiped out during 1H2011, driven by irrational pricing. During 2Q2011 TAM saw its yield plummet by 21%, while Gol saw an 8% drop in both 2Q2011 and 3Q2011. TAM in Nov-2011 initially projected domestic capacity growth this year of 4% to 5%. In 2011 its domestic capacity growth fell to 9.5% in 2011 after growing 12% in 2011. Gol during 3Q2011 initially forecast 2012 capacity growth of no more than 4%. In Feb-2012 it revised its supply forecast increase of zero to 2% before offering its latest guidance last week of flat to a possible decline in supply. Gol also recorded an overall capacity decline (domestic and international combined) from 2008 to 2009 after it discontinued its long-haul operation. Gol is eager to replace Webjet’s fleet of Boeing 737-300s with 737-800s. During the next 24 months, leases on 18 of Webjet’s older aircraft are ending, and Mr Pereira Gol says is targeting to cut 10 of the 737-300s this year. Gol’s future fleet plan for the combined carriers remains under review, which has been the case for the last couple of quarters. Gol’s active fleet at the end of 2011 was 144 aircraft, including 22 737-300s operated by Webjet, down from 24 at the time Gol announced the acquisition (see Background information). Gol’s final fleet plan should reflect the carrier’s aim to keep capacity flat. Gol CEO Constantino de Oliveira Junior stressed during the carrier’s earnings discussion last week that supply is “an extremely important aspect of our strategy for 2012”. The capacity constraint exhibited by the rivals is encouraging. When IATA cut its forecast for global airline profitability this year by USD500 million to USD3 billion, it stated there was no change in the projected USD100 million profit for Latin American carriers in 2012. With Brazil being the dominant economy in the region, it is a positive sign the yield recovery should continue throughout this year. Despite consistently falling capacity estimates by Gol and TAM, smaller Brazilian carriers are still expanding their supply. Azul during the last few years has grown rapidly, and projects 20% to 25% capacity growth in 2012 as 16 aircraft are scheduled for delivery this year. The LCC continues to rapidly add capacity with ATR turboprops and Embraer E190/E195s into markets with little or no air service. 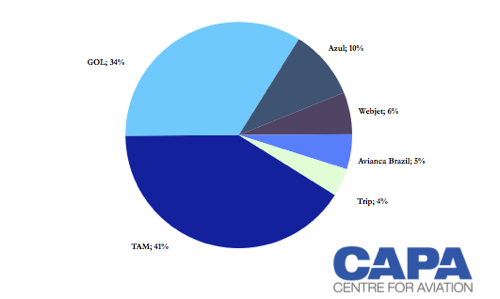 Data from ANAC show Azul’s market share in 2011 grew from 7.4% to 8.6% as its capacity jumped 69%. The carrier’s load factor for the year was 81.5%. Avianca Brazil is also charting a course for rapid growth. Its capacity in Jan-2012 grew 95% year-over-year after it ended 2011 with 26 aircraft, nine more than it previously anticipated. The carrier is in the process of taking 15 A318s exiting the fleet of LAN. These will join Avianca Brazil’s three A319s, four A320s and 14 Fokker F100s. In 2011 Avianca Brazil’s traffic grew 41%, according to ANAC data, while its market share increased from 2.8% to 3.1%. Its strategy is to target a different sector of the market as it offers a full service and a generous seat pitch in a single-class configuration. The carrier’s average 79.3% load factor in 2011 surpassed the roughly 69% average loads posted by Gol and TAM. Avianca Brazil’s traffic continued to climb in January of this year, growing 95% to bolster its market share year-over-year from 2.5% to 4.6%, surpassing regional carrier TRIP, which logged a 4.1% share in Jan-2012. TRIP’s 74% ASK growth in 2011 outpaced the 63% rise in traffic, which caused its market share to dip from 3.5% to 3.2%. But the carrier rebounded in Jan-2012, as its 83% traffic growth surpassed the 76% rise in capacity, allowing TRIP’s market share to grow from 2.4% to 4.1%. TRIP primarily serves secondary cities in Brazil with ATRs and Embraer E-Jets. But it benefits from a partnership with TAM, feeding passengers into the larger carrier’s network from the smaller markets it serves. The number of codeshare flights TRIP operates in conjunction with TAM recently increased by 76%. Overall traffic in Brazil’s domestic market increased 16% on a 13% rise in capacity in 2011, resulting in load factors increasing from 69% to 70% year-over-year. Load factors in January decreased from 78% to 75% year-over-year, reflecting 8% growth in traffic and a 12% rise in capacity. The latest traffic statistics and the capacity strategies being adopted by Brazil’s two largest carriers somewhat mirror the US market, with major carriers keeping a tight grip on capacity while smaller carriers continue to expand their supply as they stress their businesses are still in a growth mode. This is the right equilibrium for sustained profitability in the short- and medium-term, but beyond that the strategies will depend on how much growth occurs in Brazil's economy.